Approaching age 30, Newton D. Baker, a West Virginian educated at two of America’s finest universities, came to Cleveland in 1899. Baker was enormously gifted. And Baker was searching for opportunity. He found it in Cleveland, like so many before him, like so many since. And in time, Baker became a protégé of perhaps Cleveland’s best-known mayor, the great reformer Tom L. Johnson, mayor from 1899 to 1909. Baker also became the executor of Johnson’s political legacy, fashioning it into forms and philosophies that characterize Cleveland’s government and political culture even today. Johnson’s vision and the battles he waged on behalf of ordinary Clevelanders likely make Johnson better-known today than Newton Diehl Baker is. But in terms of follow-through, in terms of shaping the Ohio Constitution into what it is now, and fashioning a city charter to give Clevelanders more freedom to govern themselves than ever before, Baker, arguably, was Cleveland’s greatest mayor. Johnson had the dream, but Baker made much of it real. Baker didn’t just share Johnson’s outlook. Baker made Johnson’s hopes concrete by deploying exceptional gifts for advocacy in the courtroom. Little wonder that Tom Johnson made Newton Baker first assistant law director for Cleveland. The path from Martinsburg, W.Va., Baker’s hometown, to Cleveland, wasn’t direct, but in retrospect it looks preordained. Before coming to Cleveland, Baker had landed a patronage job as assistant to Postmaster General William L. Wilson, a West Virginian who from 1895 to 1897 was in Grover Cleveland’s Cabinet.9 In mid-1897, after Canton Republican William McKinley succeeded Democrat Cleveland, Baker took an Atlantic voyage. One of Baker’s shipmates was a highly successful Democratic lawyer from Cleveland, Martin A. Foran (1844-1921).10 In the 1880s, Foran served three terms in the U.S. House of Representatives. He was later elected a judge of Cuyahoga County Common Pleas Court. Meanwhile, Foran asked another Cleveland lawyer, who happened to have been a Baker classmate at Johns Hopkins – Frederic C. Howe – to recommend an able lawyer to join Foran’s practice.12 (Howe was more than just a classmate of Baker’s – he was also a fraternity brother to Baker. )13 Howe suggested Baker; Foran remembered Baker from their voyage – and hired him. When Newton Baker arrived in Cleveland to practice law, he was far from alone in seeking his fortune in the lakeside metropolis. Greater Cleveland’s pulsing industrial might arguably made the city and its environs that era’s Silicon Valley, albeit a Silicon Valley that produced steel and chemicals and, perhaps above all, the machine tools that made Ohio one of the world’s manufacturing giants. The city and its enterprises were exploding with growth. It was, incidentally, that human tsunami that helped prompt the birth of Cleveland’s settlement house movement, which aimed to assimilate newcomers into the city, and the adult education movement, which aimed to educate working-class Clevelanders for jobs and citizenship. Daniel Morgan, from Jackson County’s Welsh-American village of Oak Hill, got to Cleveland in 1901 after graduating from Harvard law school. In time, Morgan would help Newton Baker write Cleveland’s charter. Still later, Morgan became Cleveland’s second city manager and, toward the end of his life, a judge of the Ohio Court of Appeals (8th District). Also orbiting Johnson was Peter Witt. Born in Cleveland in 1869, Witt, like Johnson, was a disciple of philosopher Henry George. Besides Baker and Cooley, Morgan and Witt, others in Tom L. Johnson’s inner circle included Painesville native Charles W. Stage, a lawyer who served in Baker’s mayoral administration; Howe, born in Pennsylvania in 1867, a Cleveland City Council member allied to Johnson during Johnson’s mayoralty, who’d recommended Baker to Martin Foran; and Massachusetts-born Edward W. Bemis, who reformed Cleveland’s waterworks when Johnson was mayor. 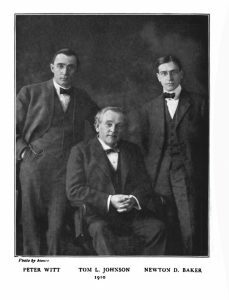 Coincidentally, Howe and Bemis, like Baker, held degrees from Johns Hopkins University, founded in 1876 as the first American research university, where future President Woodrow Wilson, who later figures large in the Newton Baker story, earned a Ph.D. in 1886. In Cleveland, as in other big cities, a cauldron of industrial expansion and population growth brought with it enormous challenges. Some were obvious: Growth could easily outpace existing urban services (streets, sewers and drains, gas-, electricity- and telephone services, public transportation). But ruthless, determined monopolists controlled the immense sums of capital required to add or expand urban services. That stark fact created a conflict of interest between elected officials eager to provide their cities with public services – and the monopolists who owned utilities that monopolized extortionately priced public services. Worse, urban service monopolists had an end-run in case a given cities officials scorned bribes and blackmail. In that case, special interests could quietly run (and lavishly finance) pet candidates. Or, at less risk, though at greater cost, special interests could grease the Ohio General Assembly to rip local decision- making away from local officials. Earlier, in 1896, the General Assembly flaunted an especially smelly example of interference in local matters. Former Gov. Joseph B. Foraker, a Cincinnati Republican and major lawyer-lobbyist, engineered General Assembly passage of the “notorious Rogers Law,” which benefited the Cincinnati Street Railway Co., the city’s streetcar monopoly, by allowing Cincinnati officials to extend – for 50 years – the streetcar company’s franchise. Worse, Foraker later “represented the transit firm before [state officials] and succeeded in winning a $285,000 reduction in the company’s tax valuation.”29 Even more outrageously, after courts ruled that the Rogers Law was blatantly unconstitutional, General Assembly members in thrall to the teeming Statehouse traction lobby tried to pass a “curative provision” to overturn the court’s ruling and thus reinstate the Cincinnati Street Railway’s sweet, 50-year franchise. This was the seamy Statehouse reality that reformers such as Johnson and Baker had to confront in Columbus. That so-called curative law, a bid “to restore such an ‘iniquitous franchise’ aroused the ire of [Newton] Baker and [Tom] Johnson, who delivered tirades against the curative proposal.”30 Foraker’s maneuvers demonstrated how it was that in that era of Ohio history, a corrupt legislature could be bought and sold by corporate interests in end-runs around good government reformers in Ohio’s city halls. Such interference by monopolies and a shady legislature that sparked Cleveland’s battle, on its behalf, and on behalf of Ohio’s other big cities, to determine local policies locally: Home rule. Any discussion of Baker’s commitment to home rule needs to be guided by an important aspect of Baker’s thinking. Interference with the affairs of Cleveland by the General Assembly was, wrong, yes, and even if it hadn’t been wrong it was done for all the wrong reasons. But what Baker really opposed was the strait-jacketing of Cleveland (or any community) with one-size-fits-all demands from a centralized government. His concerns were not so much philosophical as they were practical: Central imposition of uniform patterns was simply unworkable. Baker said that cities should be experiment stations, as, for instance, were the agricultural experiment stations Congress authorized in every state by the Hatch Act of 1887, signed by President Grover Cleveland. The act authorized grants to every land-grant college – Ohio’s is Ohio State University – to promote experimentation and disseminate the results of research. Experimenting locally meant cutting fetters clamped on at the Statehouse. In 1916, Mayo Fesler of the Cleveland Civic League sketched the objectives Baker and other urban reformers had in prying a home rule amendment from Ohio’s 1912 Ohio Constitutional Convention. Cities and villages, Fesler wrote, wanted freedom from General Assembly interference. They wanted to exercise, themselves, “all powers of local self- government.” And they wanted power to determine their own specific forms of city or village government by writing, if they chose, their own charters, as Cleveland’s voters did in June 1913. In 1916, just three years after the home rule amendment had become part of the Ohio Constitution, Fesler found that court rulings had advanced (or at least not impeded) those reform objectives.36 Interestingly, Fesler wrote that municipal home rule had “made Ohio a municipal laboratory … for promoting economy and business-like efficiency” – the very experiment stations that Newton Baker wanted Ohio’s cities and villages to become. So what, before and after the 1912 convention, did Newton Diehl Baker do to realize the dreams of Tom L. Johnson and advance of the hopes of rank-and- file Clevelanders? True, Arbuthnot found that, financially, Cleveland was in a deficit. But Arbuthnot attributed that not to municipal mismanagement but to the revenue shortages faced by many American cities. But Arbuthnot made another observation, as sound today as it was in 1916: “The growth in civic necessities has been more rapid than the growth in civic consciousness.”38 In short, voters were willing to demand and use new city services, but were also reluctant to pay for them. Too, the Ohio General Assembly, as was its right under the home rule amendment, had limited city and village taxation via the so-called Smith law. In the 1911 mayoral campaign, the primacy of the public vs. power debate was demonstrated by what historian Hoyt Landon Warner characterized as the campaign’s climax. It was a debate between Baker and Samuel Scovill, president of the Cleveland Electric Illuminating Co., now a tentacle of Akron-based FirstEnergyCorp. Western Reserve’s Arbuthnot made it clear that, in the absence of better accounting data, it was unclear if Muny Light – which began operating in July 1914 and by 1916 had 15,000 customers – was operating in the red or operating in the black. Baker didn’t seek a third term as mayor, left office on Jan. 1, 1916 – and, soon after, Woodrow Wilson named him secretary of War. Today a Greater Clevelander knows much about Newton Baker, that’s likelier due not to Baker’s illustrious civic leadership but, say, to the 800-lawyer Cleveland-based BakerHostetler law firm, which Baker helped found. Or, if a Clevelander is an Ohio State University alumnus, perhaps he or she knows that an Ohio State dormitory, Baker Hall, which opened in 1940 on the university’s south campus, several years after Baker died, is named for Baker. He was once an Ohio State trustee. Fame is fleeting, but accomplishments last. It is only a slight exaggeration to say of Baker and of the Cleveland and Ohio he helped create, as the epitaph of the British architect Christopher Wren says of Wren in Wren’s St. Paul’s Cathedral: “If you seek his monument, look around.” In Baker’s case, that means looking around Greater Cleveland – and looking around Ohio, especially at the state’s constitutional and statutory framework for city and village self- government. On the roster of political godparents of today’s Cleveland, Johnson arguably has primacy over Baker, at least in public memory. But Baker indisputably was Tom Johnson’s heir. Baker came to believe, though, that not all the reforms Progressives ballyhooed in Ohio in 1912 were necessarily unqualified plusses. Among reforms Baker later believed had been “tried and found of less value in practice” were the initiative, referendum, recall, non-partisan primaries, the commission form of city government and proportional representation.56 Ohio authorizes the initiative and referendum, and grants cities and villages, if they wish, the recall, non-partisan elections, a commission form of local government and proportional representation (though “commission” municipalities are few, and proportional representation now appears to be absent from Ohio). On the social front, Newton Baker, first as a Johnson lieutenant, then as mayor of Cleveland, finally as a post-mayoral Clevelander, promoted the idea of public responsibility for enculturation (or, in the case of immigrants, acculturation) by, for example, as noted above, establishing Cleveland College as a school for adult learners. Liebling’s New Yorker profile of newspaper mogul Roy Howard of the Scripps Howard chain (which included The Cleveland Press) recorded that Howard had been part of a “stop (Franklin) Roosevelt” movement at the 1932 Democratic National Convention. Moreover, Baker was also a supporter of the so-called open shop, a fact he had confirmed in 1922 correspondence with Samuel Gompers, president of the American Federation of Labor.68 An “open shop” refers to a workplace that does not require an employee to join a labor union as a condition of his or her employment in that job. The Cleveland Chamber of Commerce, of which Baker had been president, favored the open shop. 1 Archer H. Shaw, “New War secretary as his neighbors know him,” The New York Times (March 12, 1916). 2 “Newton D. Baker, Dreamer,” The Plain Dealer, Oct. 30, 1911. 5 Frederick Palmer, Newton D. Baker, America at War (New York: Dodd, Mead & Co., 1931), 7, citing the New York Tribune, March 7, 1916. 9 C. H. Cramer , Newton D. Baker: A Biography (Cleveland: World Publishing Co. , 1961), 26-29. 11 Cramer, op. cit., 30. 13 Warner, op. cit., 63. 14 Thomas F. Campbell, Daniel E. Morgan, 1877-1949, The Good Citizen in Politics (Cleveland: The Press of Western Reserve University, 1966), 10. 15 C. H. Cramer , Newton D. Baker, a Biography (Cleveland: W orld Publishing Co. , 1961), 198. 17 Cramer , C. H. , Newton D. Baker, a Biography (Cleveland: W orld Publishing Co. , 1961), 36. 19 Willis Thornton, Newton D. Baker and His Books (Cleveland, The Press of Western Reserve University, 1954), 71. 20 Cramer, op. cit., 41. 21 Beaver, op. cit., 5. 22 “Where Are the Pre-War Radicals?” The Survey 55 ( Feb. 1, 1926): 557. 23 “Ohio Democratic Platform, 1912,” Ohio Almanac and Hand-Book of Information (1914), 222-223. 24 Ibid. 26 Frederic C. Howe, The Confessions of a Reformer (New Y ork: Charles Scribner’s Sons, 1925), 190. 27 Hoyt Landon Warner, Progressivism in Ohio, 1897-1917 (Columbus: Ohio State University Press for the Ohio Historical Society, 1964), 36, 106. 28 Lincoln Steffens, The Struggle for Self-Government, Being an Attempt to Trace American Political Corruption to Its Sources in Six States in the United States, with a Dedication to the Czar (New York: McClure, Phillips & Co., 1906), 176-177. 29 Robert H. Bremner, “Asa S. Bushnell, 1896-1900,” in The Governors of Ohio (Columbus: The Ohio Historical Society, 1954), 133. 30 Warner, op. cit., 112. 31 Baker, “Municipal Ownership,” op. cit., 190. 33 Newton D. Baker, “Municipal Ownership,” Annals of the American Academy of Political and Social Science 57 (January 1915): 189. This number of the Annals published the Proceedings of the Conference of American Mayors on Public Policies as to Municipal Utilities, held in Philadelphia on Nov. 13 and Nov. 14, 1914. 36 Mayo Fesler, “The Progress of Municipal Home Rule in Ohio” National Municipal Review (v. 5, no. 2) April 1916, 242. 37 C.C. Arbuthnot, “Mayor Baker’s Administration in Cleveland” National Municipal Review (v. 5, no. 2), April 1916, 226. 40 Warner, op. cit., 302. 45 Ibid.. 444; Davis (1878-1950) eventually did win election as mayor, and in 1920 he was elected governor of Ohio for one term (1921-1923); Davis was mayor for a fourth term 1933 and 1934: The Governors of Ohio (Columbus: Ohio Historical Society, 1954), 163-165. Davis tried an unsuccessful gubernatorial comeback in 1924. 47 “What the issue is,” The Cleveland Press, Nov. 1, 1913. 48 Cramer, op. cit., 58 49 Ibid., 57. 52 Arbuthnot, 239. 53 Ibid., 52-54. Wilson; see David T. Beito and Linda Royster Beito, “Gold Democrats and the Decline of Classical Liberalism, 1896-1900,” Independent Review 4 (spring 2000): 568, 569. 56 “Where Are the Pre-War Radicals?” op. cit., 556. 58 John McF. Howie, “The Master Hand and Mind of Newton D. Baker,” North American Review 204 (August 1916), 319. 59 Thomas Suddes, “The Adult Education Tradition in Greater Cleveland,” 11, in Teaching Cleveland, citing John P . Dyer , Ivory T owers in the Marketplace: The Evening College in American Education (Indianapolis: Bobbs-Merrill Co., 1956), 35. 60 A. J. Liebling, The T elephone Booth Indian (Garden City , N. Y . : Doubleda y , Doran and Co . , 1942), 245- 246. 61 Oswald Garrison Villard, “Presidential Possibilities VII: Newton D. Baker – Just Another Politician,” The Nation (April 13, 1932), 414. 62 Cramer, op. cit., 41-42. 63 Clarke, a co-owner of the Youngstown Vindicator, resigned in1922 from his lifetime appointment to the Supreme Court in order to devote himself full-time to campaigning for U.S. membership in the League. 64 Daniel R. Beaver, “Baker, Newton Diehl,” in American National Biography Online. Stevenson, later governor of Illinois, was the Democratic nominee for president in 1952 and 1956, and a grandson of Adlai E. Stevenson, vice president of the United States from 1893 to 1897, elected on fellow Democrat Grover Cleveland’s 1892 Democratic presidential ticket. 66 Rosen, op. cit., 237. In December 1940 the U.S. Supreme Court ruled 6-2 (one justice recused himself) that Appalachian Electric Power Co., a unit of American Electric Power was indeed required to get a Federal Power Commission license for a dam on the New River, a watercourse in Virginia and West Virginia. The ruling represented a loss for the company, Baker’s client. Moreover, the ruling vastly broadened federal jurisdiction over hydroelectric projects generally. 69 Hoyt Landon W arner , The Life of Mr . Justice Clarke: A Testament to the Power of Liberal Dissent in America (Cleveland: Western Reserve University Press, 1959), 192. 70 Carl Wittke, “Mr. Justice Clarke – A Supreme Court Judge in Retirement,” Mississippi Valley Historical Review 36 (June 1949): 44. Emphasis is in the original. 71 New York Gov. David B. Hill, letter dated Sept. 12, 1896, to New York state Supreme Court Justice Hamilton Ward, in Hamilton Ward Jr., Life and Speeches of Hamilton Ward, 1829-1898 (Buffalo: Press of A.H. Morey, 1902), 399. American National Biography. Review 5 (April 1916), 226-241. Newton D. Baker, “Municipal Ownership,” Annals of the American Academy of Political and Social Science 57 (January 1915). Daniel R. Beaver, Newton D. Baker and the American War Effort, 1917-1919 (Lincoln: University of Nebraska Press, 1966). David T. Beito and Linda Royster Beito, “Gold Democrats and the Decline of Classical Liberalism, 1896-1900,” Independent Review 4 (spring 2000): 568, 569. (Columbus: The Ohio Historical Society, 1954). Thomas F. Campbell, Daniel E. Morgan, 1877-1949, The Good Citizen in Politics (Cleveland: The Press of Western Reserve University, 1966). C. H. Cramer , Newton D. Baker: A Biography (Cleveland: World Publishing Co. , 1961). Dictionary of Cleveland Biography. Encyclopedia of Cleveland History. Mayo Fesler, “The Progress of Municipal Home Rule in Ohio” National Municipal Review 5 (April 1916), 242-251. The Governors of Ohio (Columbus: Ohio Historical Society, 1954). John McF. Howie, “The Master Hand and Mind of Newton D. Baker,” North American Review 204 (August 1916). A.J. Liebling, The Telephone Booth Indian (Garden City, N.Y.: Doubleday, Doran and Co., 1942). “Newton D. Baker, Dreamer,” The Plain Dealer, Oct. 30, 1911. “Ohio Democratic Platform, 1912,” Ohio Almanac and Hand-Book of Information (1914). Frederick Palmer, Newton D. Baker, America at War (New York: Dodd, Mead & Co., 1931). Elliott A. Rosen, “Baker on the Fifth Ballot? The Democratic Alternative: 1932,” Ohio History 75 (autumn 1965). Archer H. Shaw, “New War secretary as his neighbors know him,” The New York Times (March 12, 1916). Willis Thornton, Newton D. Baker and His Books (Cleveland, The Press of Western Reserve University, 1954). Oswald Garrison Villard, “Presidential Possibilities VII: New D. Baker, Just Another Politician,” The Nation (April 13, 1932). Hoyt Landon Warner, The Life of Mr. Justice Clarke: A Testament to the Power of Liberal Dissent in America (Cleveland: Western Reserve University Press, 1959). Hoyt Landon Warner, Progressivism in Ohio, 1897-1917 (Columbus: Ohio State University Press for the Ohio Historical Society, 1964). “What the issue is,” The Cleveland Press, Nov. 1, 1913. “Where Are the Pre-War Radicals?” The Survey 55 (Feb. 1, 1926). Carl Wittke, “Mr. Justice Clarke – A Supreme Court Judge in Retirement,” Mississippi Valley Historical Review 36 (June 1949).